What is it that makes the visitors brain tick? That makes them overcome that “browsing” phase and become a lead or a sale? While I wouldn’t say that all the credit for conversion goes to the copy, but it certainly influences visitors’ decisions to a great extent. After all, words make people relate and understand things better. 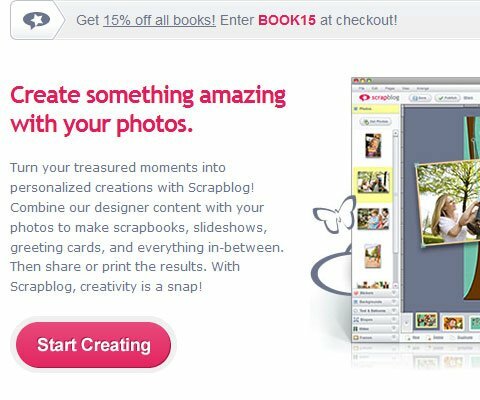 Blog subscription, request a quote, product sale, free trial signup… what is it that you want to accomplish on your webpage? Figure it out and any sentence (or even element) on a webpage that doesn’t contribute to this goal should be removed. Clichéd, yes. But very valuable nonetheless. Use short sentences and stick to simple words. Don’t write to show off your vocab. Keep that complicated industry jargon to yourself and the creative word play for your next poetry book. That won’t impress anyone here but it can sure cost you conversions. Express yourself in a way that even a 5-year old can understand. If your copy lacks clarity, persuading visitors will be an uphill task. Remember that the right ego massage here is increased conversions and not people raving about how amazing your copy sounds. 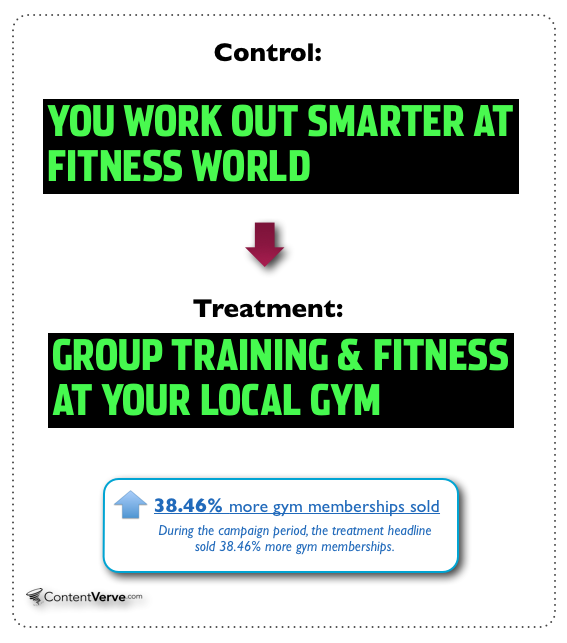 Conversion Evangelist, Michael Aagaard, tested a rather simple and non-creative headline (check out the image below) in the challenger for his client, Fitness Gym, and noted 38.46% increase for their gym membership signup. Avoid vague sentences and claims. So XYZ Company increased sales with your product. Great! Tell me exactly how much sales did they increase? What’s their business model like? Mention some details, please? Will you? Features are a passé. Communicating benefits are a great way to answer the typical visitors’ question – “what’s in it for me?” And when you use these benefits to settle your prospects’ pain points, you definitely score some extra points. New noise-canceling technology reduces background noise. So when you hold iPhone up to your ear in a loud room, you hear what matters most: the voice on the other end. So using earpods when your background noise is too high is plain annoying. But Apple’s earpods copy emphasizes how these earpods eases this pain point and allows you to shut out all outside noise with its noise-cancelling benefit. Create urgency, excitement, whatever reaction you want. But don’t forget to pack that emotional punch in your copy. “Live a gypsy’s life in a camp site on the banks of the exotic, high altitude Pangong Lake. Get that ‘Me’ time you were craving for, in one of the many little coves on the island. When I read these mails they really transport me to an altogether different world and I seriously have to resist myself from clicking that “Book Now” button too frequently. You can even convey emotional value of your offer by incorporating it into a story. A study conducted by Carnegie Mellon University in 2007 proved that stories indeed work better than hard-core facts to convince people to take action. Three groups of people in the study were sent separate donation appeals (one donation appeal for every group) over the email to contribute for people suffering in Africa. The first email included all statistics and data that talked about millions of people getting dislocated and their suffering because of fewer rains and food shortages in the country. The second email elaborated the story of some girl who hadn’t had anything to eat since days. The picture of the girl was also sent in the email and people were asked to contribute for her directly. The third email combined both the approaches and contained both the story and also the statistics from the first email. While the first and the third email got people to donate an average of $1.14 and $1.43 respectively, the second email got the highest donation average of $2.38. Although you might be expecting that the third email that combined both the approaches should have got maximum donations, but it seems like people were not too keen to help in the third email because they saw their contribution as a tiny drop in the sea. Make sure that your visitors feel special and valued in your copy. Please note that this is not a rule per se. And you can always tweak things and test them to see how it works better for your conversions. Sometimes a copy written in first person may work better than the one written in second person. You never know. A/B test is always the best way to go. Now there are various elements on your landing page where you can test your web copy to improve conversions. While the basic rules remain the same as above, you can tweak the copy of these elements easily in VWO Editor and set up your AB tests in just a few minutes. The above headline drives home the point for its visitors in an instant by comparing it to Google Analytics, which is a tool almost every visitor on their site is familiar with. Simple and effective. 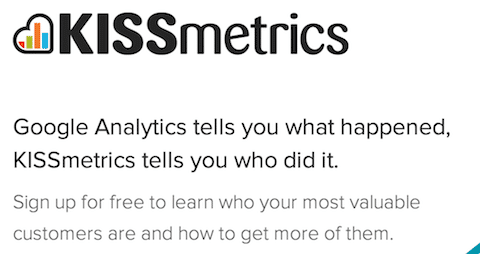 Or, I love how one of our customers used their testimonial as the headline to set up a case for them, which increased their newsletter signup by 24.31%. Ideally, I would want to include a link with all ZIP codes (next to the zip code field) to avoid confusion, if there’s any. The point is, make sure that there’s no room for prospects to wonder or feel confused about. 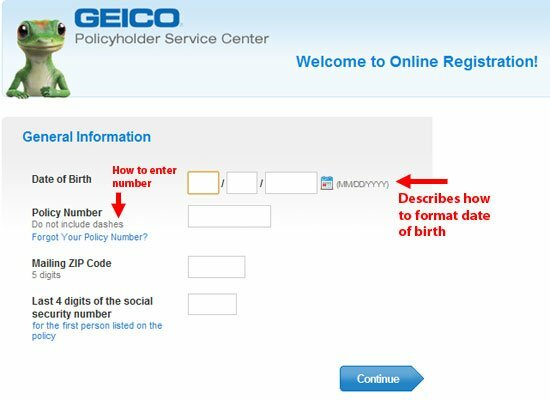 Sometimes even the most obvious things that you expect everyone to know can be the reason why your form copy fails. Apparently, the negative connotations of the word “spam” was not taken well by visitors and made them even more concerned about it than the control version that had no such statement. The context seemed to be ignored by visitors. You may even address anxiety concerns in your CTA copy. You can read further about high-converting call to action buttons here. I’m sure you must have done some copy tweaks on your landing page. How did they turn out for you? Do you have any tips or test ideas to share with me for a high converting landing page copy? Please share them in the comments section. I never cease to mention that the narrative form – using your post for storytelling – is one of the most effective techniques. It is tailor made for human psychology. We are born storytellers. Same thing about using emotive language. You want readers to take action; action requires motivation and emotion is intrinsically motivating. Regards, keep up with the great content! That’s my personal favorite too, Mark! Oh, great. This is what I looking for. Thanks for the tips. Celia, you’re going the right way! It’s very important that both are in sync. Else, expectations mismatch can cost you big time.